Part two of our series about AfrikaBurn X 2016. We met Lil Black, one of the founding five of AfrikaBurn. Lil Black: Creative Agitator from Cape Town, who likes to make and tries to grow things. ISF: We love the agitators of the world. Especially as a Berliner being an agitator is imprinted in our DNA; two world wars, the wall, east meets west … you know. So we are curious, what do you make and grow, which are your current projects? Lil Black: Creative agitation is a bit like embroidery, stitching threads that connect ideas and actions and relationships. I try and grow food. And flowers. Current project – designing a frail care wing for my elderly parents who live with us – it is my most challenging architectural and design project so far, and also the most meaningful. Lil Black: Antiques/ art gallery owner, designer, décor editor, stylist, party maker, unsuccessful farmer. What is your involvement in AfrikaBurn? You were mentioned as one of the founding five. Lil Black: My involvement was just as an original co-agitator right at the very beginning – Paul Jorgensen brought the concept to Africa and managed to get the blessing of Burning Man to make it an official regional, Robert Weinek has faithfully kept the original concept alight for ten years but the event is really the product of thousands of crazy participants – some gifted large sums of money, others devoted years of their lives and made many personal sacrifices – all have invested their intense love and an insane amount of belief into making AfrikaBurn. The San Clan symbol depicts this community so brilliantly – one body, many heads and dancing feet kicking up the dust of the Tankwa. 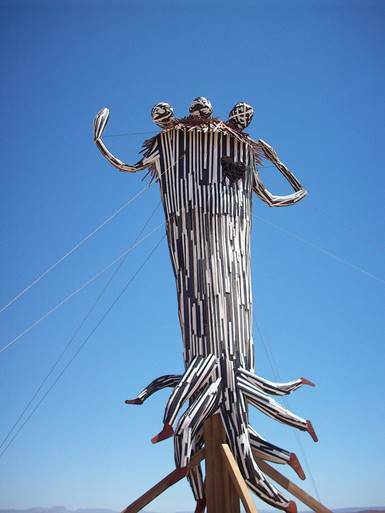 Have you been to Burning Man in Black Rock City? ISF: Are you planning to go there? People would love to see what you can create with all your artistic skills. Lil Black: For the longest time I SO wanted to go to Burning Man, but now I would prefer to participate in AfrikaBurn. Mostly because it is a community which is still small enough not to be overwhelming and especially now that this extraordinary community is beginning to make magic beyond the Tankwa, between events. 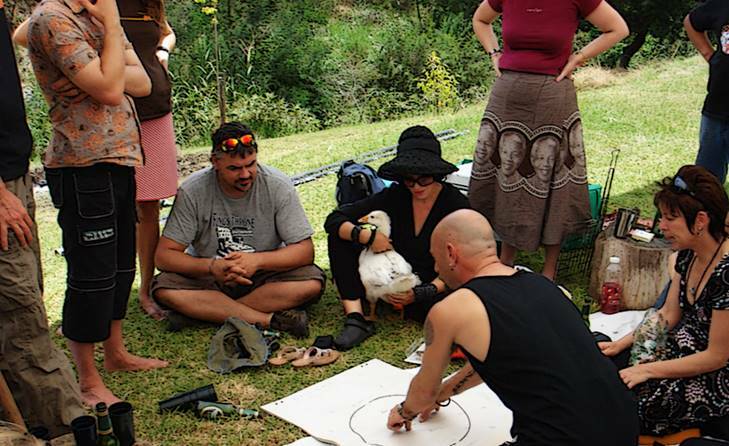 That is what excites me the most, that participants take their mind-expanding life-changing experiences in the desert and apply them to the default world. 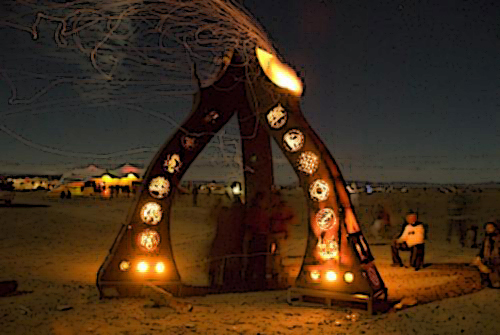 Why AfrikaBurn – how did it start? 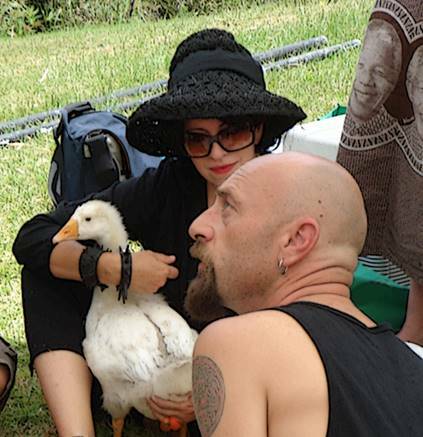 Lil Black: The first discussion about AB took place at Malplaas (my old farm). Paul Jorgensen (a South African artist who lived in America for many years and was madly implicated with Burning Man) approached our mutual friend Robert Weinek (who was deeply involved with the SA contemporary art scene) about bringing Burning Man to Africa. I had long been fascinated by BM and was ignited by the possibility of creating an African regional event, the first of which eventually manifested in 2006. Paul and I only participated in the first two events after which he left for Australia and I had to redirect my energies towards my farm which had been neglected during four years of intense AB crusading. ISF: Is Paul now involved in the Australian Burn? Lil Black: Yes he is. Lil Black: To agitate creativity, to make and grow things. ISF: What is your most exciting, motivating or world-changing thing you make and grow at the moment or did in the past in the history of AfrikaBurn? Lil Black: AfrikaBurn is probably the most world-changing thing I have ever been involved in. Besides AB my current obsession is the legalization of hemp and medicinal marijuana. And no I am not growing weed but hell I wish I was legally able to do so! How does it evolve? Does it grow organically? And yes the event evolves organically, developing more legs and heads every year, a constantly shape-shifting volatile creature that defies definition and appears to have a life of its own. What can be better (if there is anything which could be better)? This is Africa, and I have misgivings about incinerating materials that could create shelter or warmth or fuel to cook with. Perhaps some of the art could be gifted to random communities around the country, where it might inspire others to express themselves creatively, or elicit discussion and debate about AB – even if the art was torn apart for firewood it would still be more useful than just a brief bonfire in the desert. And if every one of the now 13 000 odd participants were to gift just one weekend between events – share their talents, skills and knowledge, clean up the environment or perform some beneficial service to their community – it would most certainly make a difference in the default world. ISF: About LEAVE NO TRACE, we just had the same issue at our Berlin Burning Bär. We also have to raise the consciousness about how people should deal with (their and other) trash or better preventing it from the very beginning. ISF: What is alien invasive vegetation? Lil Black: ‘Foreign’ trees and plants that are particularly invasive and if not managed properly have an adverse affect on indigenous vegetation. I love that so many AB participants have begun to use this free and abundant material in such incredibly inspiring and inventive ways. It also burns very well … ! How do you see AfrikaBurn now, what is your perception? Lil Black: I returned after an absence of eight years and was without doubt THE most overwhelmed participant at AB, and I so wished Paul Jorgensen had been at my side to witness how his dream of an African regional of BM has manifested. We owe him a huge debt of gratitude. 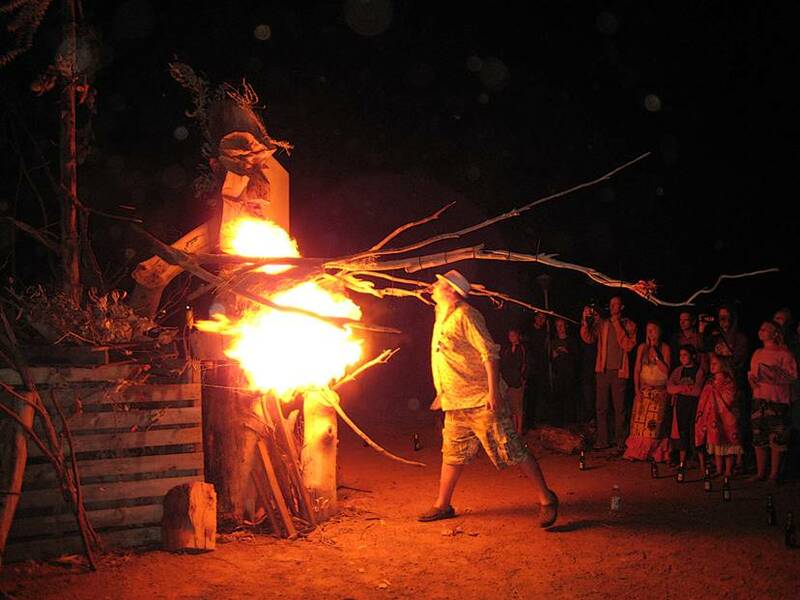 MASSIVE respect to Robert Weinek for keeping that original fire alight, to our friends, artists and film industry colleagues who lit further fires, and now the thousands of strangers from here and abroad who make AfrikaBurn. It is a magnificent many-headed multi-legged creature that dances in the Tankwa desert and then disappears without trace. What is the future of AfrikaBurn? Lil Black: Here at the end of Africa we face the same issues much of the world does – extreme wealth and abject poverty, corruption and mismanagement, white supremacy, educational disruption, food insecurity, unstable economy. Our ‘rainbow nation’ was merely a branding exercise. However the very existence of AfrikaBurn proves that we can construct our own community and engineer an alternative reality – we create our own rainbow, and the future of AfrikaBurn is bright! ISF: Do you see that ideas or principles are applied by companies, government or (groups of) people already? Lil Black: Already participants from the advertising industry, local government, corporate and banking world participate in AfrikaBurn – so yes eventually there HAS to be a visible shift in approach and attitude. The AB community represents a formidable and powerful sector of South African society (both creative and financial) and it will be fascinating to observe how over time AB influences policy and strategy. I believe it will. And I hope it will.